Growing up I was a fan of the BBC television show Connections. Hosted by noted British science historian James Burke, it traced the historical connections between two events/inventions/technological innovations that seemed at first blush to have no connection whatsoever. I'm going to attempt to do something similar, although not technological, and on a much smaller scale. end of that same century, also at sea, also with a naval barrage. Luckily they set the abridged version to music! Let's begin with the "rockets' red glare" and see how that leads us eventually to the Spanish American War. The quote above is, of course, from America's national anthem, "The Star-Spangled Banner." 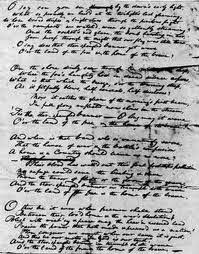 Originally a long poem written after the all-night pounding that Fort McHenry, which guarded Baltimore Harbor, taken at the hands of the British fleet during the War of 1812, "The Star-Spangled Banner"'s author Francis Scott Key is famous for that piece of writing, and for little else. Never mind that he was an accomplished lawyer who came from a wealthy, accomplished, and deeply religious, Maryland family. Key was, for decades, the United States Attorney for Washington, D.C. THIS was Washington's handsomest man??? turns out, far less upstanding) son, Phillip Barton Key. Dubbed "the Handsomest Man in Washington," the younger Key was a notorious flirt, and widely suspected of committing adultery with any number of willing, lonely married women in the nation's capital. One of these lonely women was a dark eyed beauty of Italian extraction named Teresa Sickles. 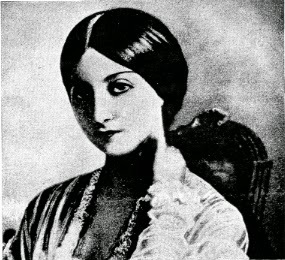 The daughter of expatriate Italian parents (her father was a noted musician and music teacher in New York City), Teresa initially met her future husband Dan Sickles when he rented a room in her family home while studying law at N.Y.U. Dan was twenty years old. Thirteen years later Dan, now thirty-three, got the sixteen year-old Teresa pregnant and they eloped. Some who study 19th century American history would describe Dan Sickles as a product of his age: a machine politician of the first order who never saw a bribe he wouldn't take or a skirt he wouldn't chase. Put simply, he was a skunk. No less an authority than New York lawyer and diarist George Templeton Strong, a contemporary of Sickles, once said of him: "One might as well try to spoil a rotten egg as to damage Dan's character." Sickles got himself elected to Congress, moving his young family to Washington, D.C., where he continued his philandering, his drinking, and his dabbling in wholesale graft. It was at this time that Teresa, bored, lonely, in a strange city, where she knew few people, embarked on an illicit affair with none other than "the Most Handsome Man in Washington," Phillip Barton Key. The Sickles family lived on Lafayette Square, within sight of the White House (at the time still known as "the Executive Mansion"), and Key was wont to take up station on a park bench across the street from his paramour's house, signaling her discreetly with a handkerchief, when he wished to "get together." Sickles got wind of the affair when he received a poison pen letter from an anonymous source (likely a jilted lover of Key's, or perhaps a jealous husband?). Enraged, he confronted Teresa, who tearfully confessed all. And then Dan Sickles made history. After forcing his wife to write down her confession, Sickles hid in his house, lying in wait for Key to take up his customary spot on his customary bench. 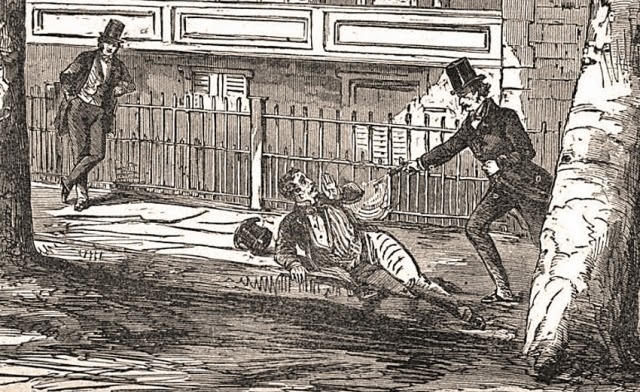 When the U.S. Attorney for the District of Columbia showed up, sat down and waved his handkerchief, Sickles took up a pistol, rushed out of his house, into the street, and shot Key multiple times. Key did not die immediately, but suffered in great pain for several hours before expiring. "Crazy"? Not so crazy as to leave the house in order to murder his wife's lover without his top hat! Sickles immediately turned himself in and made history with his affirmative defense: he claimed "temporary insanity." Sickles actually got more heat in the court of public opinion for publicly "forgiving" his wife for her affair than for cold-bloodedly murdering a man a stone's throw from the White House! This all took place in 1859, on the eve of the Civil War. And while Sickles "forgave" his wife, he never again lived with her or allowed her to see her children. She died a broken woman in 1867. For his part, Sickles quickly got himself appointed a brigadier general in the army once war broke out. 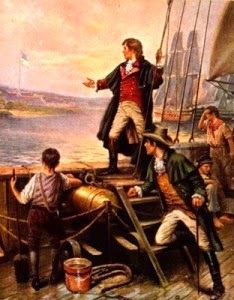 He was the worst kind of "political general": insubordinate, arrogant, thieving, and not above lining his own pockets at the expense of the welfare of his men. General Sickles, hat still on. and led his troops into a trap that led to heavy casualties under murderous fire. 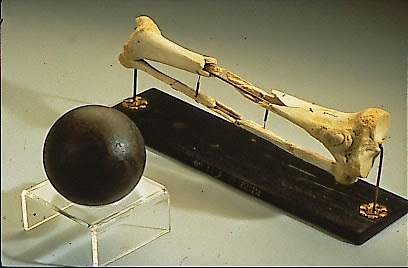 Sickles was one of those casualties, losing his right leg to a cannon ball during the battle. He later received a Congressional Medal of Honor for his act of willful disobedience. Now how many palms do you suppose he had to grease to pull of that coup? After the war Sickles returned to politics and used his influence both to defend his actions (usually by libeling such superiors as George G. Meade, who commanded all federal troops in the battle) and to ensure that a river of federal dollars flowed toward the establishment and maintenance of a national battlefield site at Gettysburg. During one of his frequent visits to the battlefield, Sickles was asked why, with all of the statues to various heroes of the battle dotting the landscape, was there no memorial to Dan Sickles? Sickles' reply? 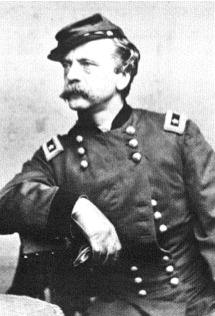 "This entire battlefield is a memorial to Dan Sickles." Slick, huh? A politician's answer, right? Absolutely. And a whole lot sweeter sounding than the truth: a memorial for Sickles had been planned, with money both appropriated by the government and donated by third parties. And then Sickles, who was tasked with overseeing the project, stole the money. 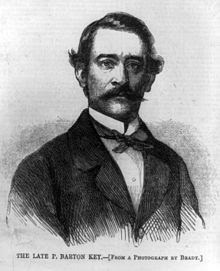 After his wife's death in 1867, Sickles was appointed U.S. Minister to Spain, where he spent six years flirting with the dowager Queen Isabella II (rumor had it he slept with her), married for a second time, and, through bellicose dispatches back home over incidents such as the Virginius Affair, did his level best to get the United States embroiled in a war with Spain over that old sore spot, the island of Cuba. The problem for the United States was that her navy was nowhere near the equal of Spain's then state-of-the-art, steel navy. Cooler heads (in the person of U.S. Secretary of State Hamilton Fish) prevailed, and war was avoided. 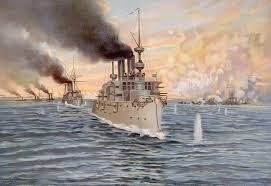 At the same time the United States government, realizing its current navy was unable to adequately defend its coasts, embarked on a race to update its navy which culminated in the Battle of Manila Bay over two decades later, during the long-delayed Spanish-American War, where the by-now decrepit Spanish fleet was destroyed in a single afternoon by a single American naval squadron. Had that battle place in 1874, instead of 1898, the outcome would have likely been the absolute reverse of what history has recorded as a resounding American victory. Manila in 1898: the direct opposite outcome of what likely would have happened in 1874! And Dan Sickles? He survived it all, filling a succession of government plum posts, from several of which he was dismissed for looting the coffers he had been set to oversee. And he went on visiting his leg at the Smithsonian until his death in 1914 at age 94. Enough material for several novels! Brilliant! I loved this post so much, I shared it with my husband, Duncan, and he said to tell you, "Great writing, great story." He said that he remembers reading years ago about Sickles at the Battle of Gettysburg, and he now has a much better understanding of the man. To me, after a career in law, I was fascinated that Sickles could have been the first to claim temporary insanity and get away with it. A great article! I love the part where he stole the money for his own memorial. Priceless! What a tremendously interesting post! Thank you so much!!! One of the most marvelous things about history is the juxtaposition of things that are so entirely different from now -- with those that haven't changed a bit! It's so delicious. You've done a marvelous job of evoking it. Sickles apparently didn't rest easy--he was supposedly seen visiting his leg after he died. According to museum guards, who usually quit, his was a most unpleasant haunting. I'm with Eve. What venality, stealing the monies for one's own memorial.